There was a lot of action at the recently held annual general body meeting (AGM) of the Nadigar Sangam on the 27th November 2016 wherein Sarathkumar and Radha Ravi were expelled from the association. 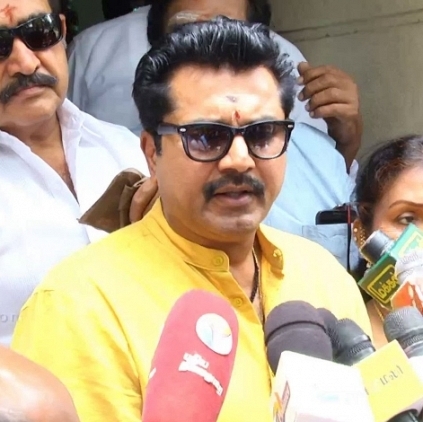 Reacting to this, Sarathkumar said, “In my opinion, it is a planned vindictive action against Sarathkumar. I will take the legal route to face this. First, they said we had committed 150 crore scam, then it came to 60 crore and now it is 67 crore. They are inventing new things every day just for the sake of finding faults. We have provided all the accounts to them. Nadigar Sangam is something wherein all the artists work together in harmony but now there is a lot of polarization”. Official : Tamannaah in this popular remake! Nation's No:1 camera mechanic passes away! Breaking : Ranjith - Santhosh Narayanan collaboration continues! People looking for online information on Nadgar Sangam, Sarathkumar, Vishal will find this news story useful.